If that scenario sounds familiar, you’re in the right place. That’s why we’re going to lay out what benefits you should look for when making your pick, so you can find the perfect phone case that combines protection with showing your personality. That little piece of technology is worth almost a month of rent for most Americans. But, they’re not just expensive, they also hold our memories, contacts, and even our secrets. That stuff is priceless. Since most protection plans don’t account for broken screens or drop-induced damages, we have to be sure to protect them from any unfortunate selfie drops, late-night fumbles, or multitasking mishaps. Most phone case companies use regular TPE rubber to protect your phone from impact. Only Speck uses an IMPACTIUM shock barrier to resist damage from any drops and dings. It’s proven to be 52% more absorbent than other rubber shock dampeners used by our competitors. That’s why it’s vital to choose a durable phone case that provides drop proof protection. If possible, pick a case that exceeds the 4-foot military drop protection standards. How to know if your phone is protected? We all drop our phones, whether it falls out of our pocket, flies off our lap when we open the car door, or slip-up when taking a selfie. 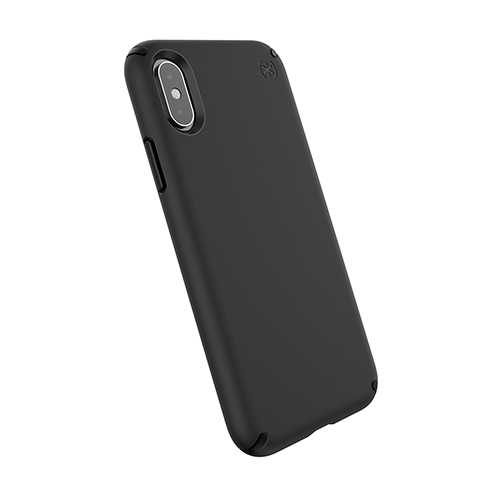 Make sure you choose a phone case manufacturer that uses a rubber or a shock absorption material on the inner or exterior linings of their phone case to absorb the impact and minimize the shock or damage of a drop. Try choosing a 2-piece phone case. The soft, interior rubber combined with a firm exterior will provide better shock barriers to absorb the impact and resist damage. Now more than ever, you’ll find countless stylish phone cases for your iPhone, Samsung, Google, or LG device. Do you enjoy a simple look? How about a grippy feel? Are you active? Do you love glitter? Or do you want to show off the beauty of your phone? With so many options it can be an exercise figuring out what you like. There IS such a thing as too many options. If you’re a simple soul and are looking for something that’s going to protect your phone and provide a minimalist style upgrade, it’s best to go with a solid color phone case. These phone cases will give your phone serious protection with a slim design, so you can have drop proof confidence whether you’re crushing the boardroom or the boulevard. They’ll give your look just the right amount of flair while not sacrificing any protection. If you’re living a life in motion, whether it’s running every morning or working out every night, you’ll want a protective phone case that provides maximum durability and shock absorption. Nothing worse than breaking your phone at 6:30 am on your Monday morning workout before you’ve even started your week. Also, keep in mind that if you’re living an active life, you may want an added layer of protection. I’m not just talking about drops, I’m talking about protection from germs and bacteria. That’s why it’s important to find a phone case with anti-microbial treatments. These active lifestyle cases will give you a tremendous trio of drop-proof protection, cool style, and antimicrobial treatments that inhibit bacterial growth on the case. Gyms are dirty, doesn’t mean your phone case has to be. With devices like the iPhone XR, the XS, or the Samsung S9, our phones are becoming more like works of art. They’re as powerful as they are pretty. For that reason, many people are starting to buy clear phone cases that show off the beauty of their device. Keep in mind, many clear phone cases are going to yellow due to UV rays and from the oils in our skin or makeup. That’s why it’s best to make sure you pick a clear phone case with a coating that’s been tested and proven to resist ugly yellowing and discoloration from the oils in our skin and from UV rays. Now, if you’ve got glitter running through your veins, you’ll more than likely end up choosing something that sparkles. It’s important to understand that not all glitter cases are created equal. Most have cheap glitter flakes that are coated onto the exterior of the case. If that’s the case (pun definitely intended,) then they’ll fade and wear off as you use it, creating more of an eyesore than a head turner. That’s why you’ll want to make sure you get a glitter phone case that uses high-quality metal glitter. It’ll reflect more light and produce a more magnificent shimmer. Also, make sure that your case has two layers with the glitter embedded in between them. It’ll prevent the glitter from wearing off or flaking away onto your clothes. The world is a dirty place, and we touch a lot of things throughout the day that have germs or bacteria on them. Your typical phone case has about 7 times as much bacteria as a toilet seat. That’s pretty disgusting. Think about this, how many times a day do you touch your phone then eat something? How many times a day to you touch the toilet then eat something? Yeahhh. For those active people out there — gym equipment is known to have even more bacteria on it than a toilet seat. Remember: Not all anti-microbial phone cases are created equal. You’ll want to make sure that your antimicrobial phone case inhibits the growth of bacteria on the case so you can stay protected from things you can’t see. Nothing worse than getting a new phone case, only to find out it’s too big to fit comfortably into your outfit. Sure, it may be protective, but it’s an eyesore that takes forever to get out of your pocket, and it weighs down your phone. That’s why it’s best to choose a slim phone case that has sleek lines, hugs your phone, and compliments the design of your iPhone, Samsung, or LG device. Get a durable, dual-layer phone case. Preferably one with at least 8-foot drop protection. Don’t forget to choose an antimicrobial phone case. It will inhibit the growth of bacteria on the case and keep you protected from things you can’t see. Make sure your phone case shows off the beauty of your phone. It should be stylish, slim, and protective. An anti-microbial treatment that inhibits the growth of bacteria on the case. Stay Clear coating that resists discoloration from contact with oils and uv rays. IMPACTIUM Clear that provides drop proof protection on drops up to 8-feet. A slim design and two-layers protection with a soft touch grip for security and comfort. IMPACTIUM to provide drop proof protection on drops up to 10-feet. Raised bezel screen protection provides extra defense from breaking or shattering if your phone falls face-down. Soft-grip strips on the exterior to provide an iconic look and no-slip grip. We hope these tips have helped in your search for finding the best phone case for you. Whatever phone case you choose, make sure it’s the perfect combination of durability, stylish design, and anti-microbial protection. Your phone is an extension of who you are, so protect it in style.